The cutting sequence generation module determines the sequence in which the parts are to be cut. The cutting sequence generation module is a logical extension to nesting. 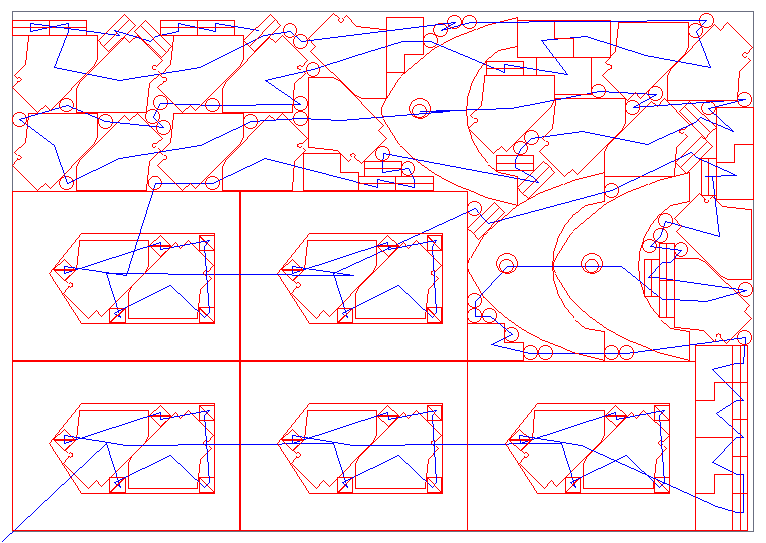 After the parts are nested, you need to cut them. For cutting, you need to first determine the sequence in which the parts are to be cut. This is the cutting sequence generation and that’s what we do for you in this module. The cutting sequence module takes the list of parts nested on the sheet and their location as input. Each part instance input has a unique identifier. The output of the cutting sequence module is the list of identifiers, in the sequence in which they are to be cut. It is as simple as that. During generation of the cutting sequence, we take care of cases such as parts nested inside the holes of other parts. Obviously, you would want to cut the inside part first before the outside part. The user can specify the start corner of cutting as any of the four corners of the sheet and proceed in either the horizontal or vertical direction for cutting. While cutting some materials, the temperature of the metal around the laser also heats up significantly. Sometimes with this temperature increase comes warping of the flat sheet metal. This warping can be very dangerous with respect to the operation of the laser. When the metal is no longer flat due to warping the laser head is prone to crashing. It also yields material handling issues.